On Friday 30th June 2017, we reached the golden milestone of 50 years in business. For a small, family run business, this is an outstanding achievement that we are very proud to celebrate. 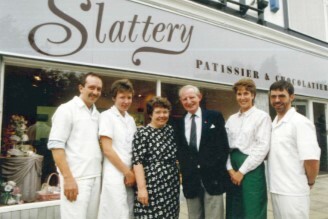 The Slattery business started in 1967 with Bernard and Margaret Slattery opening the bakery in Crumpsall. John Slattery joined the business in 1972. During the 1970's, the business expanded by opening a shop in Salford. John's sister Ann and her husband Steve Barnes joined the business in the late 70's with the Salford bakery being replaced by one in Prestwich village in 1979. In 1991, Bernard and Margaret retired with John, Steve and Ann taking over the running of the business. John opened the Whitefield shop to focus on cakes and chocolate whilst Ann and Steve continued to run the Crumpsall bakery. In 1993 the shop moved to bigger premises in Whitefield with the coffee shop opening in 1995. The final move to our current premises took place in 2004 to the old Masons Arms pub. Over the years there have been multiple extensions with the decision to close the Crumpsall bakery for good in 2012 and move everything to one place. In 2017, our 50th year, we renovated our school where many courses and private tuition classes take place every week. The expansion of the business from where it started is something the Slattery family are extremely proud of. The business wouldn't have made it to 50 years without the help of our customers and we wanted to celebrate our big birthday with them. In doing so, every day during the month of June, we ran competitions in our shop and on our social media sites Facebook, Instagram and Twitter. By simply liking our Slattery page and our competition post, your name was entered in our draw. Customers that visited our shop filled in a contact slip and the winners were selected randomly from our prize draw at the end of the day. There were a range of fabulous prizes on offer each day including gift vouchers, hampers, chocolate gifts and many more. All our mini prizes led to the grand prize on Friday 30th June of a night's stay for two at the Innside by Melia Hotel in Manchester along with a complimentary Slattery ultimate hamper which is filled with £120 worth of Slattery goodies. We received over 20,000 entries over the month for all our competitions, with an outstanding 2,500 people entering our grand prize draw on the final day! After all the build up to our big birthday, we opened the doors on Friday 30th June to welcome our customers with 50 years of memories. Every customer received a slice of birthday cake, a ticket to enter our grand prize draw and the option to purchase a loaf of bread for just 9p! Available to buy on this special day were some of our creative ideas from over the years. We had marshmallow ice cream cones, meringue figures, jam and lemon tarts, iced fingers, Eccles cakes, Chorley cakes and pig and frog fondant fancies. We made our very own Slattery chocolate bunny in which our customers guessed the weight in a bid to take him home. One of our chocolatiers was set up in the shop with chocolate truffles for demonstrations and for the customers to try. With music playing from the last 5 decades, there was a real celebratory atmosphere in the shop with both our staff and customers getting in the birthday spirit! As well as celebrating and thanking our customers, we wanted to throw a party to share our success with our staff, suppliers, family and friends. On Sunday 9th July, we set up our party on the car park next to our building. Complimentary food and drinks, fabulous singers, bouncy castles and children's games were amongst the afternoon of entertainment. We had our own "Chocolate Challenge" with the famous Slattery chocolate discs, inviting people to attempt to eat 50 discs in 5 minutes, the winner completing 47! We were blessed with the rare occasion of sunshine in Manchester which topped off a brilliant day of celebrating our 50 years of success with over 250 people who helped make it happen. The Slattery family thank all our customers, staff, suppliers, family and friends for loyal support, enabling us to reach 50 years in business.